Your cat doesn’t want to wear pajamas. Really. This shouldn’t be a revelation to anyone who’s ever seen or met a cat. And yet there are now advertisements for cat pajamas. Apparently, according to the advertiser, you should buy your entire family matching pajamas for Christmas — including the cat. Don’t do that to your cat. There are a lot of problems with the consumerism of this season, from the early appearances of Christmas decorations before Halloween, to the first rush of “true” Christmas shopping on Black Friday — or even the evening of Thanksgiving — to the last gasps of after Christmas shopping that brings the seasonal madness to a close. Some would say that we should remember the “reason for the season” — our respective religious holidays, and not the consumerism that has taken them over. Some point out that we push ourselves to the breaking point under self-inflicted pressure to clean and decorate the house, cook the food, throw the party, give the perfect gifts, and to be (or simply appear) merry and joyful as we do it. 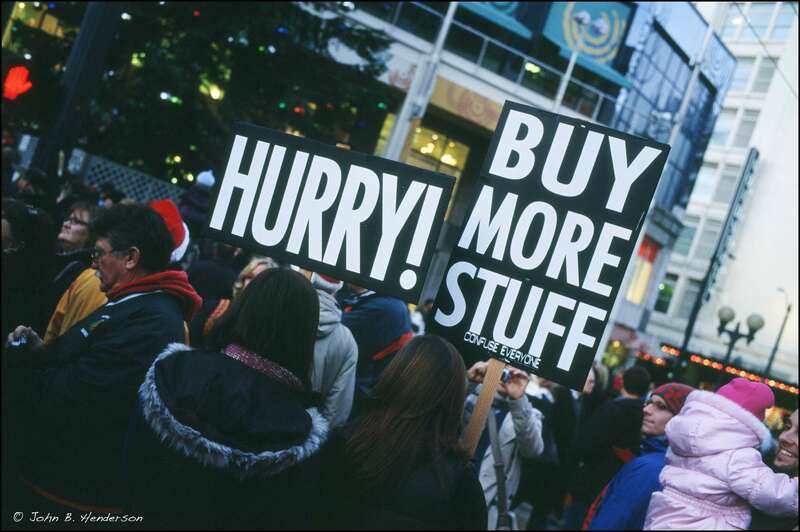 But there’s also simply the amount of waste that we produce if we fully give in to the consumerism of the season. You might as well just take the money you planned to spend on those and burn it. You might force your miserable cat into adorable PJs a total of once, but you probably won’t try it again. You’ll be too scratched up. When we travel for the holidays, or buy gifts, or throw parties, our consumption has an impact on the planet. So should that mean that we abandon parties and gifts altogether in honor of Mother Earth? I don’t think so. But we can use our brains a bit. Do you really need to buy the Christmas cards that are each individually wrapped in plastic? Or can you get an equally good card that doesn’t waste plastic? Does your dog really need his own Santa outfit? Or, for that matter, his own stocking? And maybe we don’t need entire sets of Christmas-themed dishes that we only use once a year either. What about a compromise of just one, nice Christmas platter you can bring out annually instead of an entire set of festive plates, bowls, and mugs? What if you gave gifts of experiences, like concert tickets or museum memberships, instead of things? And before you buy that thing on the 50 percent off sale… ask yourself if you need it. Having a greener holiday season doesn’t need to mean abandoning all fun or buying nothing. It just means exercising a bit more mindfulness instead of getting swept up in holiday madness. For example, by remembering that your cat doesn’t want or need pajamas. The post Cat’s Pajamas and Other Signs of Holiday Endtimes appeared first on OtherWords.